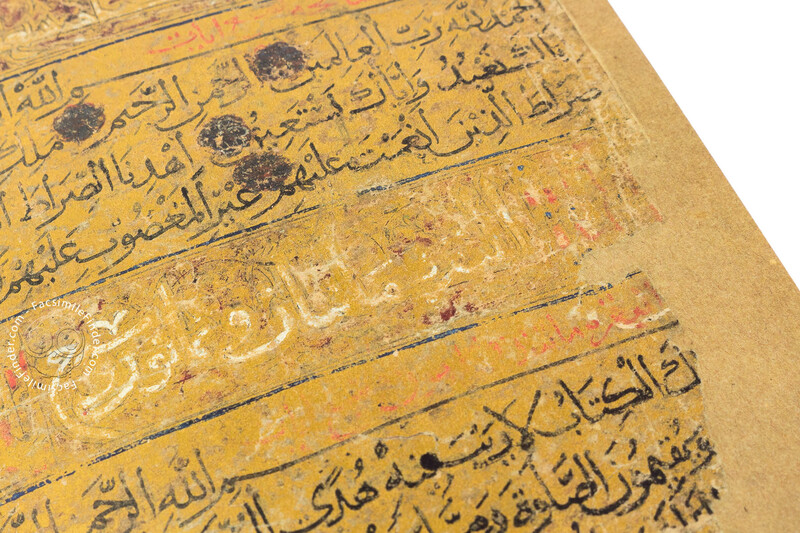 Coloured writing materials were used only rarely in Qur’an production: a famous exception is the Blue Qur’an in kufic script, single leaves of which have been auctioned over hundreds of years. 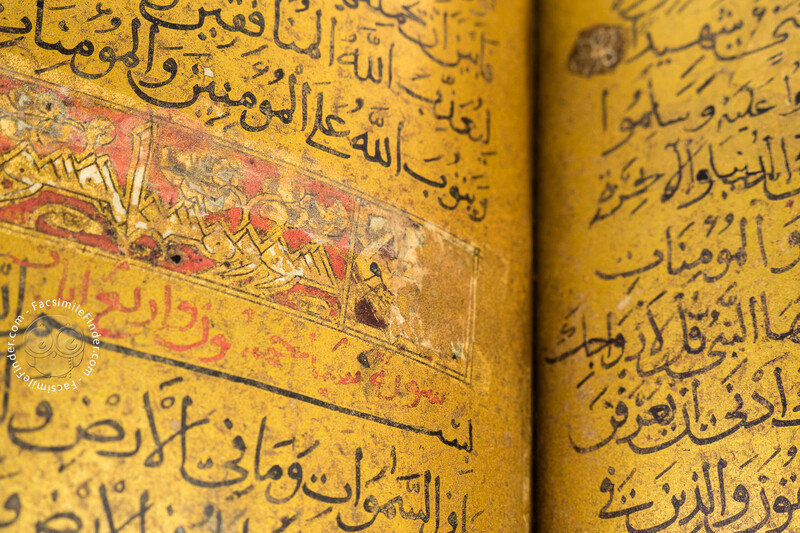 Some Qur’an manuscripts were dyed with saffron or crimson. 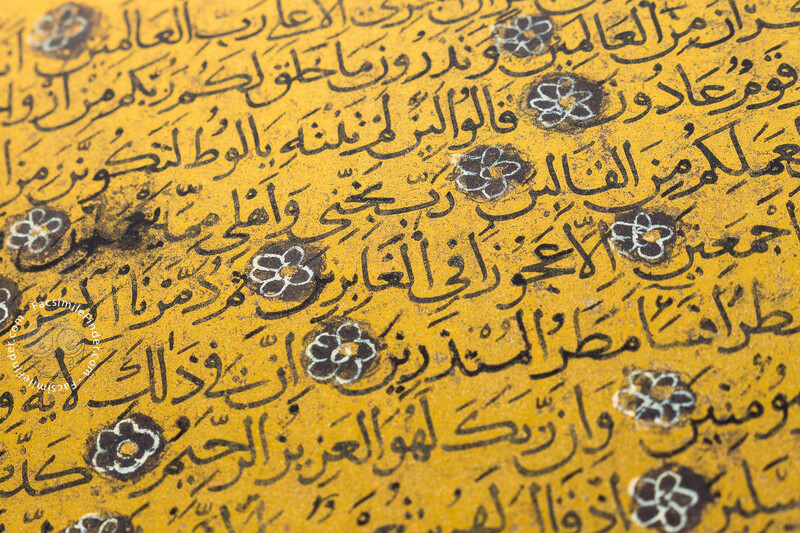 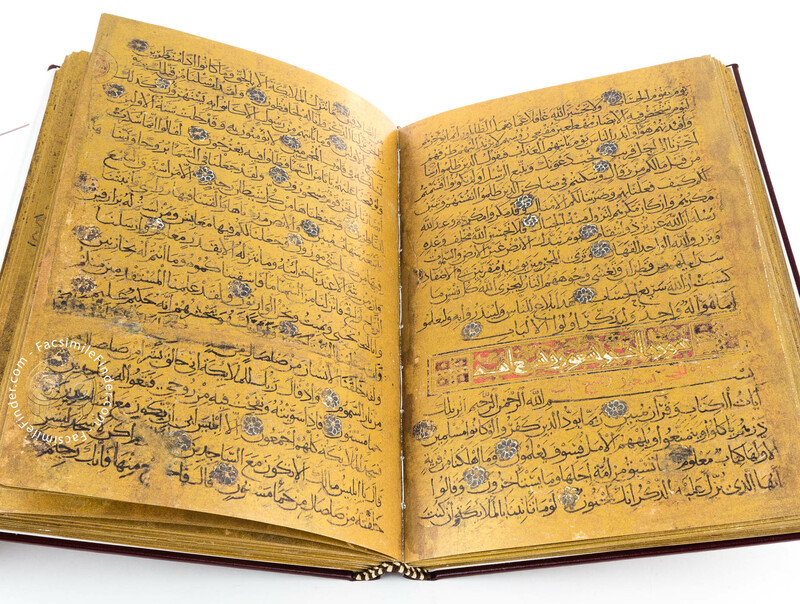 The present Qur’an, which presumably originates from Iraq or Iran, has been written in black naskhi script on paper and is a unique piece due to its gold coated paper. 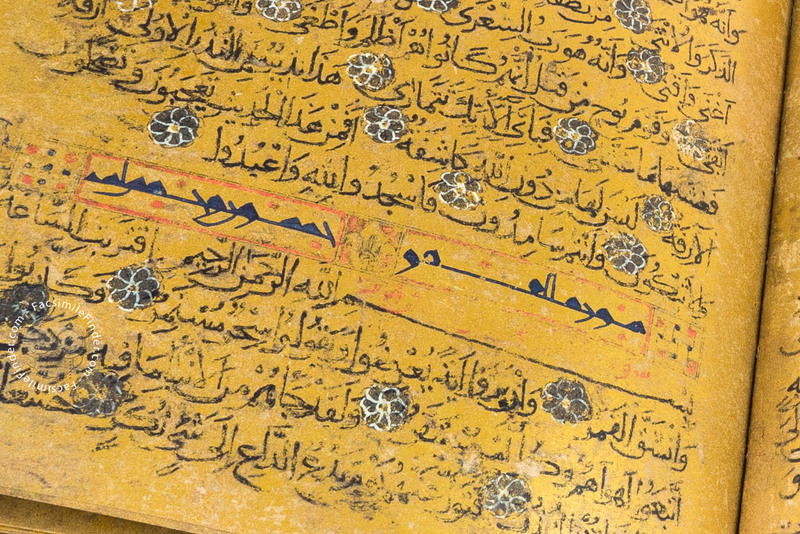 Naskhi was standardised as a precisely proportioned cursive script by the calligrapher Ibn Muqla (died 940) in the 10th century. 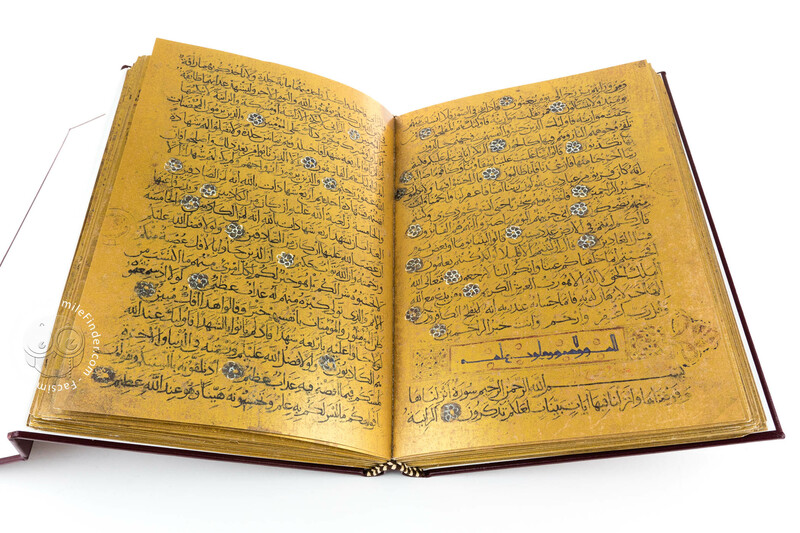 Its unit of scale is the alif, the first letter in the Arabic alphabet, upon which the size of all the other letters is based. 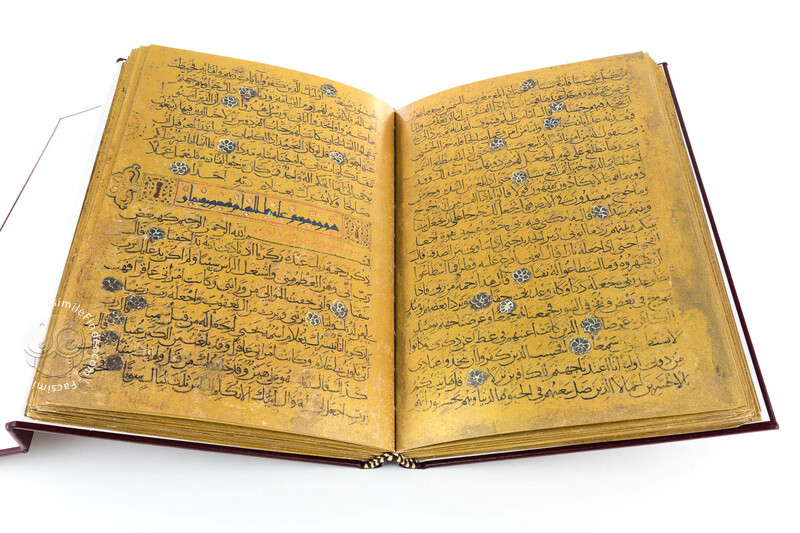 The famous calligraphers Ibn al-Bawwab (died 1022) and Yakut Musta’simi (died 1298) also based their work on this mathematical principle. 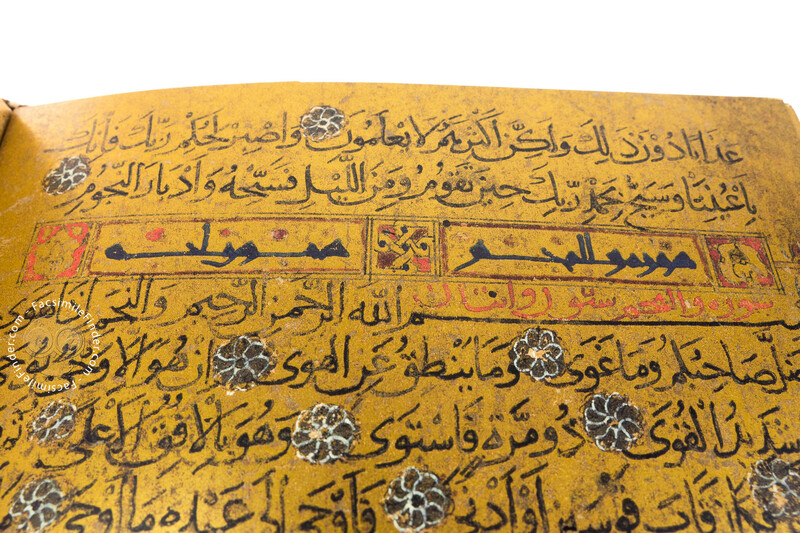 The fragment of a decorative page at the start of the manuscript displays a geometric pattern consisting of octagons, stars, quatrefoils and script medallions. 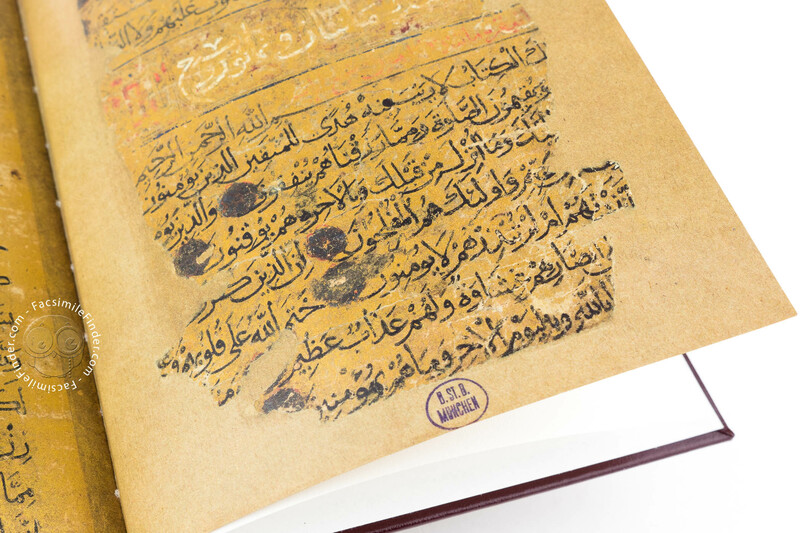 The sura headings are framed in blue, white and reddish brown kufic or a cursive script and decorated with floral and arabesque patterns. 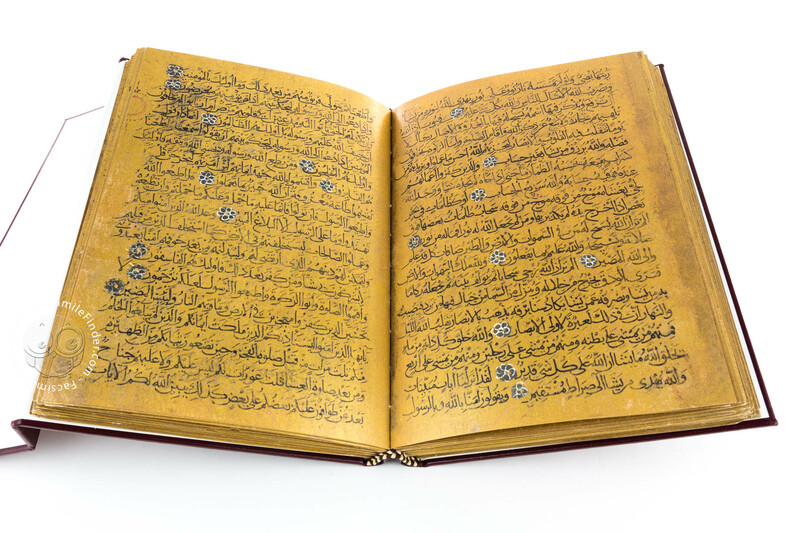 The basmala which occurs at the start of all the suras except for the ninth sura takes up either all or most of the first line. 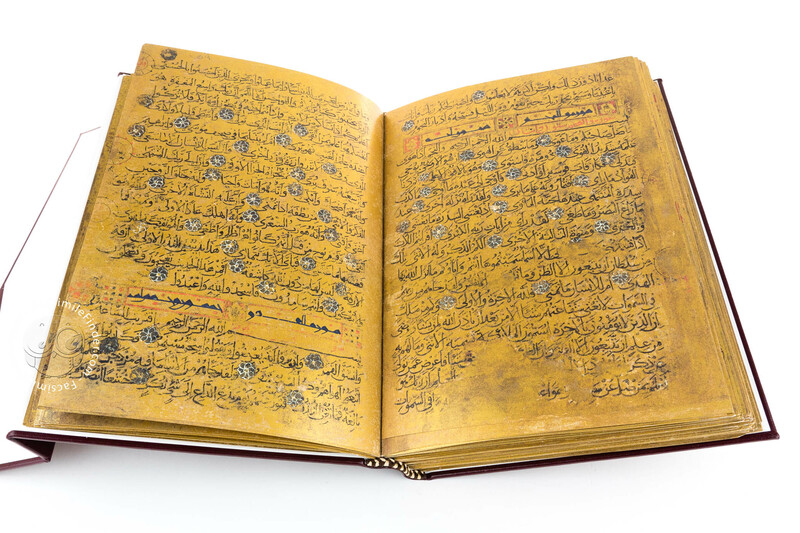 The title of the sura is repeated with an indication of the verse number in red ink above the long, extended letter sin in the basmala. 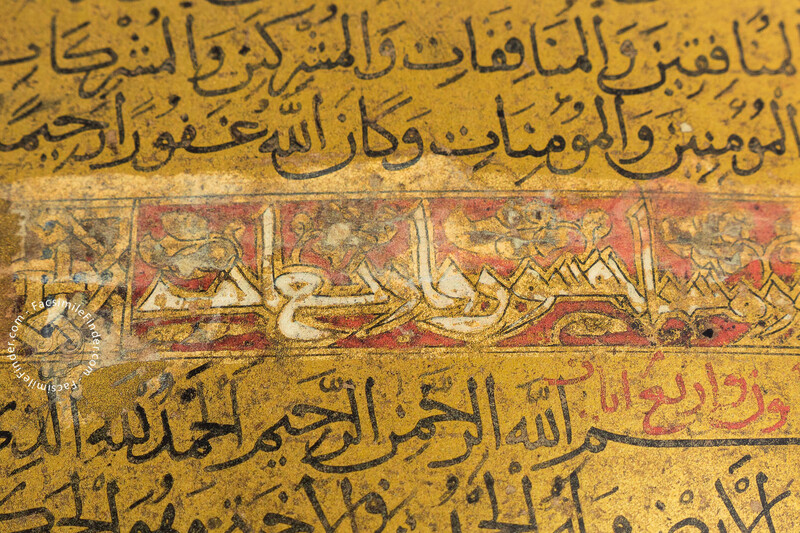 The text is fully vocalised and the verses separated by rosettes. 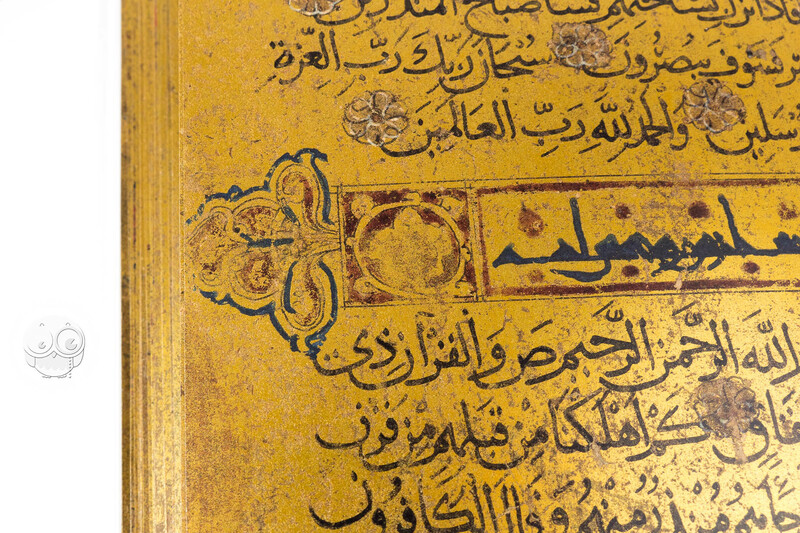 Some of the ornamental work around the edges has been lost because the book block was trimmed for a later binding. The Qur’an features a number of criteria which place it in the school of Ibn al-Bawwab: the unusual arrangement of the first page with two sura titles, the elongated letter sin in the basmala, the distribution of the basmala across almost an entire line, the use of colours which Ibn al-Bawwab had just introduced such as white, brown and crimson red and black ink, the slight leftward slant of the vertical letters, the dense and yet extremely clear style of writing are characteristic of this school. 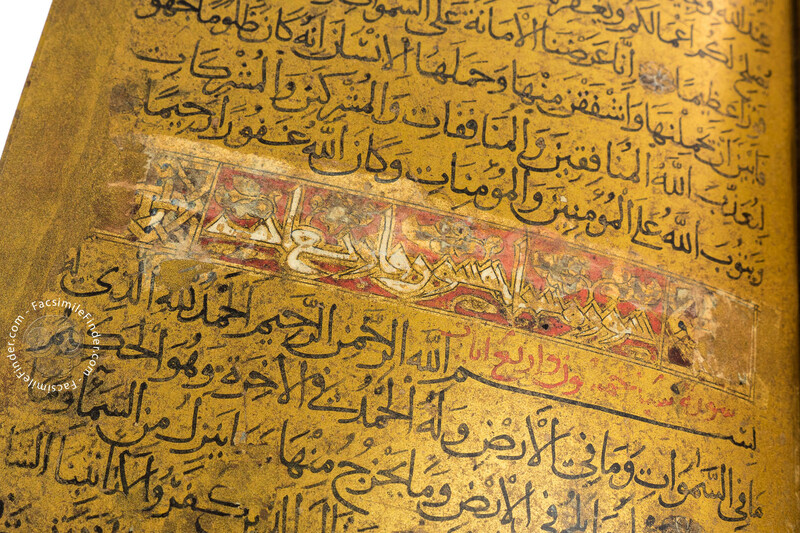 The quality of this unique codex on gilt paper, which was lavishly restored and hence saved over the course of a year in 1967 at the Institute of Book and Manuscript Restoration, part of the Bavarian State Library, would also correspond to the elevated status of the above-mentioned school of calligraphy. 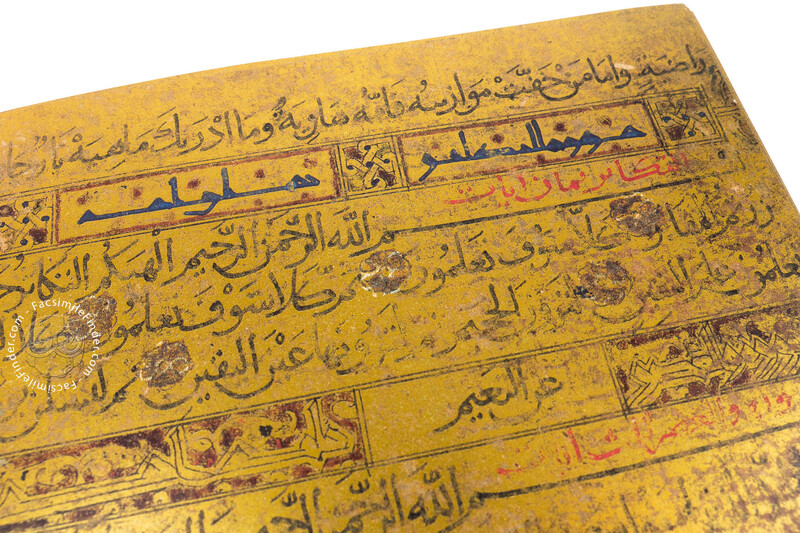 Manuscript book on paper − 26 × 18 cm − 366 pp. 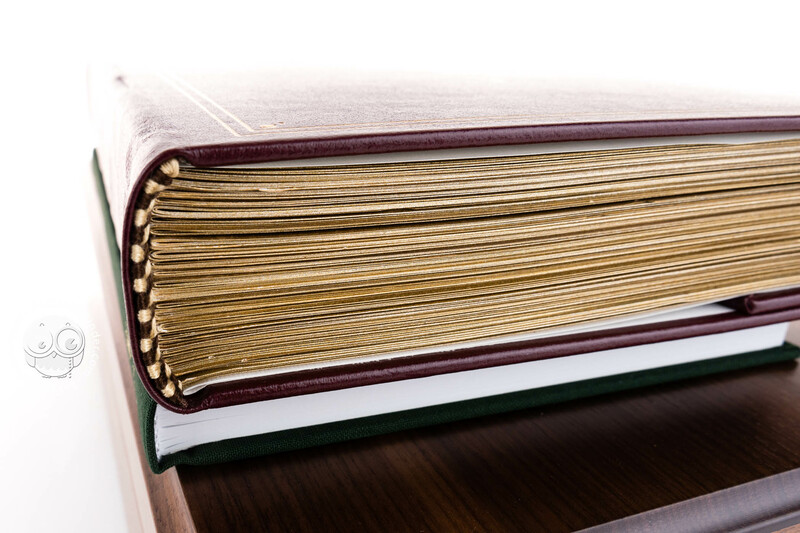 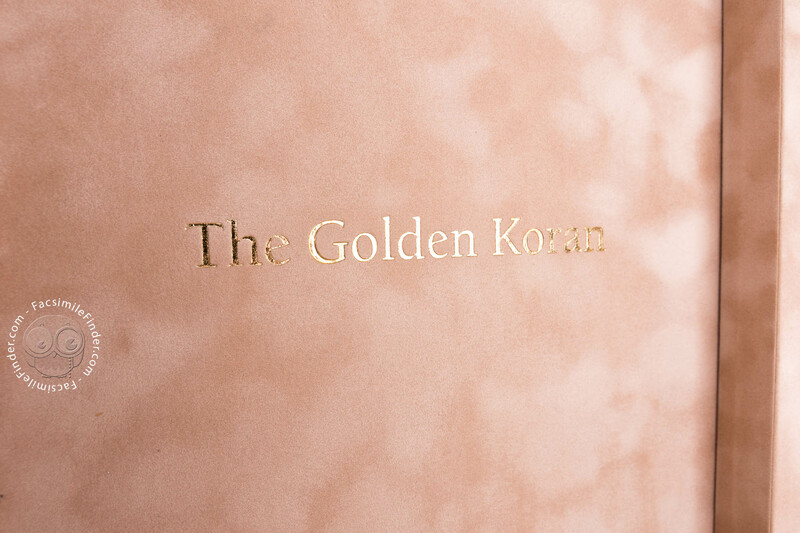 Full-size color reproduction of the entire original document, Golden Koran: the facsimile attempts to replicate the look-and-feel and physical features of the original document; pages are trimmed according to the original format; the binding might not be consistent with the current document binding. 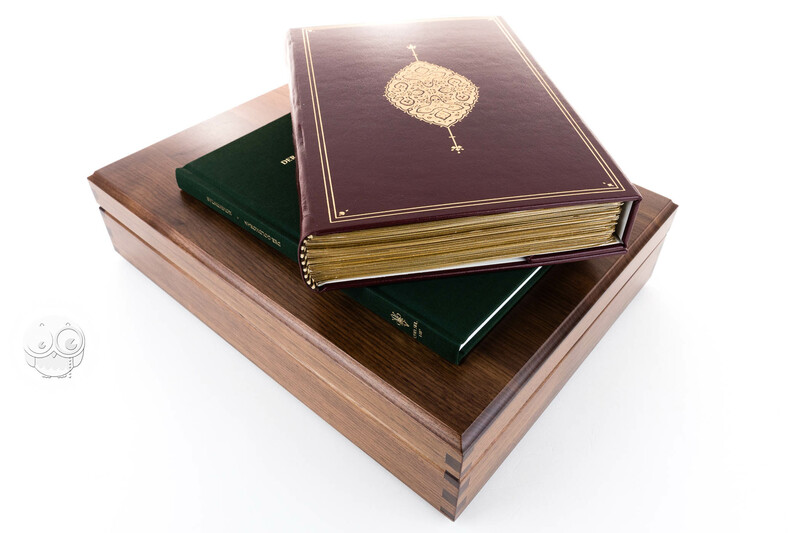 Issued in a wooden box.